Quinoa Chocolate Cupcakes with Goat Cheese Honey Frosting – flour-less, gluten-free and dairy-free! Okay friends, here it is…. I made these lovely chocolatey treats for my class (22 five and six year olds) and friends on my birthday. The batter recipe is one I perfected a long while ago for a chocolate flour-less cake but it works just the same for cupcakes. They were a huge hit with anyone who had one (or more). Many people have asked for the recipe, most not believing they are simply made with quinoa. No Gluten, No Flours, No Dairy and as little sugar as I think I can manage. The frosting is made with powdered sugar but I can’t seem to make a decent frosting without but a little sugar sometimes isn’t such a bad thing. I love them as mini cupcakes, they are a perfect pop in your mouth size this way and I don’t feel guilty at all eating two or three! Enjoy! Rinse quinoa well and strain with fine mesh strainer. Bring rinsed quinoa and water to a boil, cover and reduce to minimum heat until water is absorbed then remove from heat and let stand covered for a minimum of 10 minutes. Fluff with a fork and allow the quinoa to cool completely. Heat oven to 375°F. Lightly grease the bottom and sides of the cups of two 1 dozen non-stick cupcake pans or use cupcake wrappers. 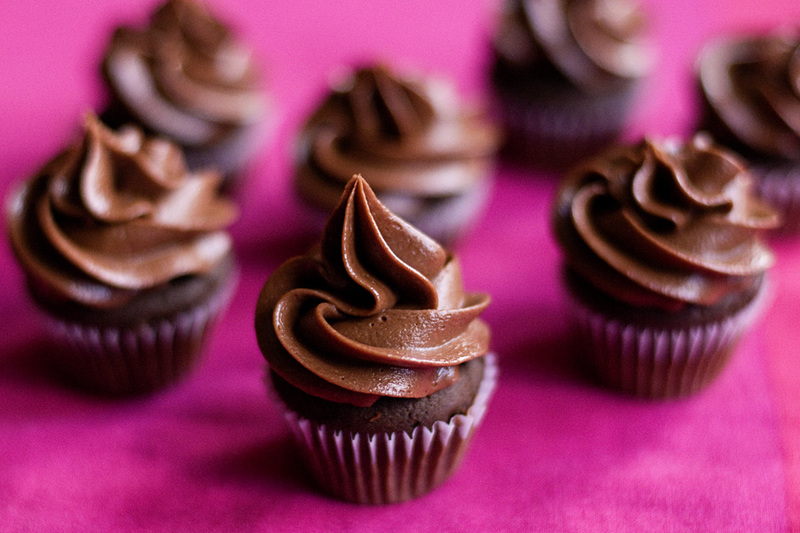 You can also make mini cup cakes (makes approximately 3 ½ dozen minis). Combine the milk, eggs and vanilla in a food processor or blender. Add the cooked cooled quinoa and blend until really smooth. Add the oil and melted butter and blend some more. In a medium bowl, mix together the sugar, cocoa, baking powder, baking soda and salt then add the quinoa mix and combine well. I actually just mix in my food processor but I wouldn’t suggest doing this step in a blender. Scoop the batter into the cupcake pans until almost full and bake for 20 to 25 minutes or until the cake bounces back when lightly pressed. Remove from the oven and cool completely in the pan before serving or frosting. Cream butter and cream cheese together in a mixing bowl, slowly add your honey as you continue to mix. Then slowly, bit by bit add the cocoa and powdered sugar, alternating between the two. Add vanilla and almond milk until desired consistency is achieved. I like mine light, fluffy, if you like yours a bit more stiff add more powdered sugar or cocoa to firm it up a bit. More powder sugar would make it sweeter; more cocoa would make it darker. Frost cupcakes when cooled however you like, I make a frosting bag with wax paper. Store frosted cupcakes in the fridge or freezer.